Hi all! It's Timeless Tuesday time! This week, Ally is challenging everyone to CASE a DT card. All you have to do is go to the Flourishes Gallery by clicking HERE, pick out a card that you would really like to make yourself, and make something similar using the same color combo, stamps, and/or layout. When you post your card, be sure to give credit to the original designer by linking to their creation. I chose to CASE Stacy's Poinsettia and Boxwood card. I LOVE the blue/brown color combo, the rounded corners, and sweet, simple layout. I don't own the Poinsettia and Boxwood set (wish I did though...I love how she colored her poinsettia), so I swapped it out for my Sentimental Christmas set, added some die-cut snowflakes, changed the clear rhinestones out to silver pearls, and used some dark brown ribbon instead of light brown. The die-cut Classic Ivory oval with the sentiment is up on foam tape. My card measures 4.25" square. Be sure to stop by and see what the rest of the Timeless Tuesday ladies have created for you today..... Allison, Amanda, Cindy, Heather, Makiko, Mona, and our July Guest Designer Patti Gilliam. Good morning, everyone. Here's hoping this is the last sympathy card I'll need for a while now. The layout is Sweet Sunday Sketch #164 and stamps are from SNSS ("Sheltering Cherry Blossom"). The image was colored with E41, E42, E43, R00, and R02 Copics. 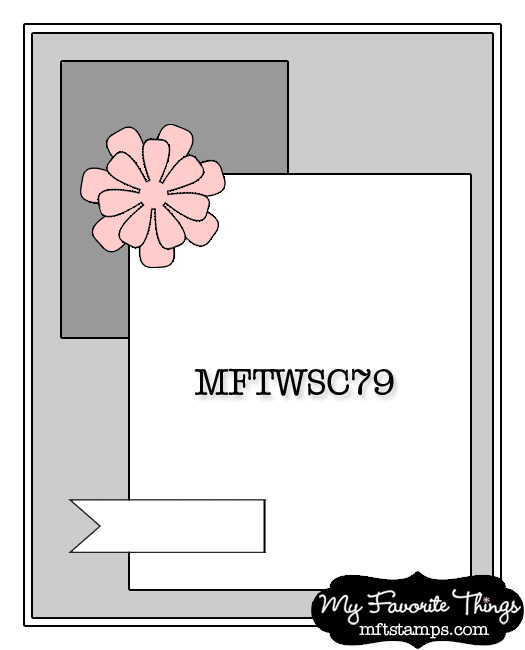 The tag die is from MFT Stamps and the pink ribbon is from PTI. I used Sweet Sunday Sketch #163 for the layout (switched out a bow for the flower element, and moved it to the left to accommodate the image) and new July release stamps from Sweet 'n Sassy (The Sea and Sheltering Cherry Blossom). The image and sentiment were stamped in sky blue Brilliance ink and cut out with a Romantic Rectangles Nestabilities die. Note about the bow: I punched a hole in the main image with my slot punch so I could thread the ribbon through it and tie the bow right over it. Hi everyone. Sorry I've been quiet lately, but there's been a lot going on in the last week. My mom is still recovering wonderfully from her knee surgery, but unfortunately in the midst of all that, my father-in-law passed away. We just had his funeral services yesterday and all went well....so now it's just a matter of letting Dan, my MIL and BIL grieve and deal with all the emotions that go along with it. One day at a time, right? I made this sympathy card (for a friend who lost her grandfather) this morning using one of the brand new July sets from Sweet 'n Sassy Stamps. I was lucky enough to win the whole July release just by leaving a comment on Cathy McCauley's blog (thank you, Cathy and Korin for drawing my name! )...and I think this bridge from "Bridge of Hope" is my favorite. So pretty! It's a quick CAS card, 4.25" x 5.5" with rounded corners, some DP and ribbon. Hi everyone. It's time for this week's Timeless Tuesday Challenge. Mona is challenging everyone to make a Christmas card or project.....and be sure to check the bottom of my post regarding some awesome SALE info going on at Flourishes right now! I made a 4" square card using Sentimental Christmas along with some Kaiser pearls, May Arts striped ribbon, and some ivory crochet cotton lace. The scalloped kraft circle is up on foam tape over the ribbon. 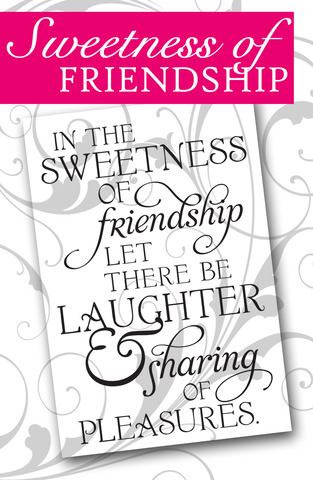 The sentiment is stamped on classic ivory card stock. Flourishes is having a Christmas in July SALE! Each year around this time, Flourishes kicks off a festive sale that is sure to warm your hearts and get you in the spirit long before the snow starts to fly! Between now and the 31st of July, all of their Christmas sets will be a whopping 25% off! Just click HERE to see all the fun sets that are on sale. They just got a NEW shipment of stamps to stock up so the Flourishes warehouse is stacked to the brim with Christmas goodies. There are no codes -- all stamp sets are automatically marked down for you! All my recipe cards are 5" x 7" and I have clear sheet protectors for them to slide into (to keep them from getting messy while cooking). I printed the recipe onto Classic Ivory CS, stamped the strawberry basket (from Flourishes "Strawberries" set), and colored it with Copics (Poppy Collection, Leaf Green Collection, R22, 0, E31, E33, E35, W1, W3), and added a little twine bow. Helloooooooo! It's Timeless Tuesday Challenge time (#FTTC178) and I'm so excited about today's challenge from Amanda.....it's to make a favorite summer (or any other season) recipe on a card decorated with your favorite Flourishes stamps! I LOOOOOVE making recipe cards!! As luck would have it, a friend of mine just introduced me to this "fire and ice salsa" recipe that I definitely wanted to make into a recipe card. It's salsa made with watermelon instead of tomatoes. Maybe you've heard of it, but I hadn't. I tried it and oh my word, it's really good!!! I used my Wild For Watermelon set (oh yes, how I love this set! ), stamped the images on classic ivory CS, colored all the watermelon with Copics (Poppy Collection, Green Grass Collection, W1, W3, and R59), cut out the four designer watermelon slices with scissors and popped them up on foam tape, added some crochet cotton lace in between the pattern papers, and added some Kaiser pearls. My recipe card measures 5" x 7" and I store my cards in plastic sheet protectors within a three-ring binder. If you're looking for a recipe template, Flourishes has two in their downloads section. Check it out by clicking HERE. Be sure to stop by and see what the rest of the Timeless Tuesday ladies have created for you today..... Allison, Amanda, Cindy, Heather, Makiko, Mona, Jan Marie, and our July Guest Designer Patti Gilliam. So, for this week only ... through SATURDAY.. you can cash up on some serious savings and stock up on some goodies that you might need in your craft room! Here's a peek at the categories that will be on sale for 25% off! So act now because once some of these items are gone, they will be gone forever! To take advantage simply use the code CHASALE in the coupon code box at the time of checkout. Make sure to hit Apply and Recalculate in order for your discount to take effect. There will be no rain checks! Click HERE to start shopping! Hi all! I can't believe it's Monday already. Last week we were at the beach and we had an awesome time! I really wasn't ready to come home yet. :( We got home on Saturday, I got laundry done, grocery shopping done, and watched some movies with Kara. Today, my mom is having surgery on her knee, so I'll be headed to the hospital this afternoon to see her. Have a really great day, everyone! Hey there and happy Saturday! I couldn't wait to ink up my brand new Bike Ride set from Flourishes. Looooove this bicycle! The bicycle is stamped on Classic White CS and colored with Copics (New Violet Collection, Leaf Green Collection, 0, W1, W3, E31, E33, E35). For Thursday's "triple play" challenge, I added three twine bows and little trios of Kaiser pearls. The sentiment is up on foam tape and the bicycle panel is up on a second layer of foam tape on the card base. My card measures 5" square. Hey there! It's release week at Flourishes and time for a Flourishes Noon Time Challenge. HOW TO PLAY: To be in the running for this fun-filled challenge, all you need to do is use three of something on your card or creation - pearls, flowers, colors, layers... the sky is the limit! 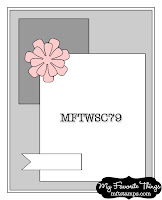 If you upload to Splitcoaststampers, please use the keyword FLLCJULRW2. Entries must be in before Friday, July 13th at 5PM EST. 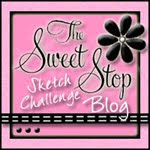 To enter, make sure you link up your creation over on the Flourishes Blog using the Inlinkz Widget. Play along and you'll be in the running to win Flourishes' entire July Release! Simply create a card using three of an item on your creation! We’ll announce the winners Saturday in our Winner’s Circle Post – check back Saturday, July 14 at noon CST to see if you’re one of the lucky winners! That's it from me today. Thanks so much for stopping by and have a great Thursday! Hi all and happy Tuesday! I'm hosting the Timeless Tuesday challenge this week (FTTC177), and I'm challenging everyone to make a sentiment the focal point of your card or project. 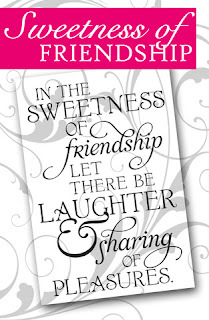 I used the brand new Sweetness of Friendship set that's making its debut today (be sure to stop by Jan Marie's NEW blog, as this sentiment is the theme of her new blog.....AND......she's going to give away this set to the first 25 people to comment on her new blog!!). It's stamped onto Classic Ivory cardstock. The sentiment was cut with a tag die and popped up on foam tape. The pearls at the bottom are by Kaiser. Be sure to stop by and see what the rest of these designers have created for you today..... Barbara Anders, Beate Johns, Christine Okken, Cindy Lawrence, Jan Marie Caruso, Sharon Doolittle, Silke Ledlow, Stacy Morgan, Tammy Hershberger, Allison Cope, Amanda Havon, Cindy Haffner, Heather Jensen, Makiko Jones, Mona Pendleton, and our July Guest Designer Patti Gilliam. 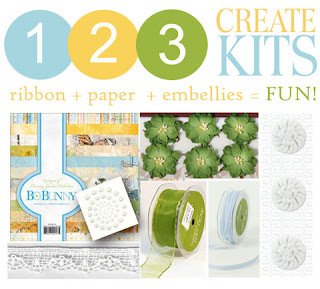 of the designers are using a fresh picked 123 Create Kit! These kits have everthing you need to create color coordinated cards with paper, ribbons and embellishments - all in one kit! Travel HERE to see for yourself! Hi all! Yesterday was my birthday as well as the holiday and we had a really great day! My friend Dawn and I went out to breakfast at Shady Maple (smorgasbord...oink!) and we chatted until noon, she made a small cake for me, then I came home to some "birthday pie" (Kara's idea since "mommy loves pie the most. "), I had a little crafting time, Hailey and Nate joined us for the rest of the day, and then ALL of us went to see some fireworks. Fun day! I hope all of you here in the States had a wonderful holiday as well. This is one of the cards I made yesterday. 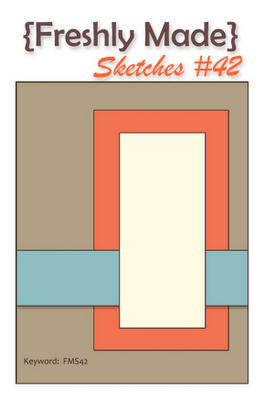 The layout is Freshly Made Sketch #42 and the colors are from Color Throwdown #199. Stamps are from Sweet Nature (Flourishes), papers are called "Glory" (Authentique), I layered some ivory cotton lace over some turquoise satin ribbon, added a "Jovial" button, embossed the kraft panel with Swiss Dots, and popped the main image up on foam tape. The main image is stamped on classic ivory, cut out with a long deckled rectangle (Spellbinders), and colored with Copics (Flourishes Poppy Collection, Flourishes Leaf Green Collection, BG0000, and BG11). Stickles were also added to the rose. Hi everyone! It's time for this week's Timeless Tuesday Challenge. This week, Maki is hosting the challenge and it's "All About Summer" (FTTC176). 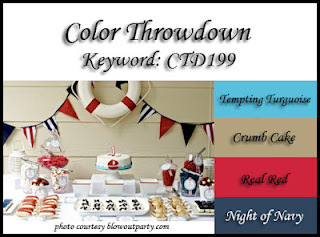 Make a card or project with a summer theme. For my card I used a combination of Beach Life (flip flop images) and Seaside Life (sand dollar, seashell, and sentiment). The patterned papers that the images are stamped on is Paradise Beach by Echo Park, the card base is Flourishes classic white, the die-cut sentiment is up on foam tape, I made a sailor's knot with twine (check out this great tutorial by Barb Anders), and added small Kaiser Craft pearls to the flip flops. Be sure to stop by and see what the rest of the Timeless Tuesday ladies have created for you today.....Allison, Amanda, Cindy, Heather, Makiko, Mona, and our July Guest Designer Patti Gilliam. I used the Hello sentiment from my Flourishes "Strawberries" set. It's stamped in Sapphire Distress Ink onto the die-cut flag, and I added a Basic Grey "Jovial" button. The butterfly is a Martha Stewart punch, the kraft circle was cut with a Spellbinders circle and embossed with my Swiss Dots embossing folder, and the Classic Ivory flower behind the butterfly was cut with a Spellbinders blossom die. The die-cut blossom is up on foam tape. Papers are Summer Fresh by Simple Stories.